Ford's Integrated Diagnostic System (IDS): This is the current OEM tool for all Ford/Lincoln/Mercury dealers as well as Mazda dealers. Introduced to the Ford dealer service departments for model year 2005, this PC based tool covers all Fords models from 1996 to current year. The IDS VCM hardware and required cabling, plus the IDS application software and a DVD based subscription of re-flashing calibration files and software updates for the IDS. All pre-installed into a Ford Certified new Dell Latitude laptop. 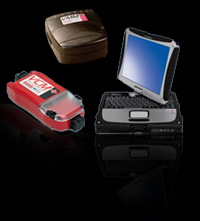 The entire package is then packaged into a custom blow molded case with custom cut foam cushioning for the laptop and IDS. New Generation Star Tester- The NGS tool is an alternate tool for Ford Service. Produced by Hickok Corporation, this scan tool will put the automotive aftermarket shop at a 'dealer level' capability when working on Ford/Lincoln/Mercury vehicles. The Ford dealer techs have access to two tools for scanning Ford products: the IDS (Intergrated Diagnostic System) and the 'NGS. The NGS coverage includes all Ford vehicles from 1984 to 2007. Scan data, codes, bi-directional controls and access to all controllers including Powertrain, Body, Chassis, ABS, GEM, FEM, REM, PATS, signal simulation, and multi-meter. NGS 2007 CAN VIM Update: Now available the 2007 MY software package that also enables the NGS to read CAN communication vehicles. Any NGS or NGS-XL can be updated to enhanced CAN communications by purchasing this kit. Please note the 2007 CAN VIM Kit update does not add any prior years coverage of non-CAN vehicles. Coverage does include all 2007, 2006, 2005 CAN and Non-CAN vehicles, plus 2004 and 2003 CAN Applications. NGS Software Update: For those shops that already own an NGS, this is the Pre-CAN 2004 software update package. This update package will update any older NGS to include 1984-2004 model year coverages for all non-CAN applications. NGS testers with software from as far back as 1998 will be upgraded to current levels. Package includes new additional PCMCIA card and updated manual. For those NGS owners with software older then 1998, there is a second upgrade kit available. ANY NGS can be updated to the current 2004 MY levels. There are essential, additional cables also needed to complete the functional updating of this tool.